Materials used in organic farming are all composed from native occurring plant, mineral, and animal sources, not labs or industrial by-products. Fertilizers are made from various manures, cover crops, and animal processing scraps. Pesticides are derived from things like Marigolds (Pyrethrum), minerals (diatomaceous earth) or bacterial cultures (BT bacillus thuringensis). 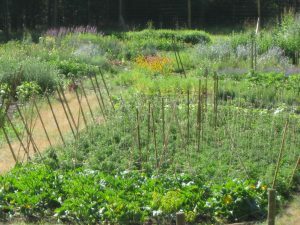 Organic practices also include techniques that encourage building of the soil through crop rotation, application of composts, increasing microbial soil life, and supporting biodiverse crops and wildlife. Look around before picking a spot! Observe sun and shade patterns. Note prevailing winds and other exposure issues. If possible, avoid areas with high weed populations, you’ll save yourself work later. Whats your budget? Raised planter beds/boxes are the most expensive, but produce the most, and are the most space efficient. If you have lots of space, consider lower mounded raised beds without the box. In Texas, home made hoop houses and shade covers extend the season and protect against exposure. Bring in soil and amendments. Heavy clay soils in Texas require a lot of initial preparation generally. Create at least 18” of rich soil in planter boxes, and a minimum of 6-8” of rich soil for mounded beds. To regular topsoil, add 1-2” of compost (up to 6”), fertilizers (amounts depend of type), and trace minerals if you have the budget (kelp and nettle are both good plant sources, extracts available commercially). Till it all in! Several passes generally. You can turn it in with a shovel and spade, but be prepared for some hard sweaty work. Select plants based on what you like, but if you only have a small bed, don’t plant pumpkins or corn. For budgeters, some crops cost lots more, in space, water, and fertilizers. The more space you can give a plant, the more drought resistant it will be. For instance, if you space tomatoes 6 to 8 feet apart in hills, you only need a deep watering once a month after the initial 2 months of watering 2-3x a week. The deeper the fertile soil, the closer things can be spaced. 18’’-24” raised beds can be planted twice as close together as field beds. For instance, lettuce can be planted on 4-6” spacing, rather than 8-10” in the field. NPK- The 3 numbers on all fertilizers. Nitrogen supports vegetative growth, Phosphorus supports flowering, and Potassium supports fruiting. That is an oversimplification, but the easiest way to select a fertilizer based on your needs. Manures provide the essential nitrogen for plant growth. Chicken and rabbit manure are the best for medium and high demand crops, horse/cow/goat/sheep is good for medium and low demand crops depending on quality. Chicken is high in P and K, as is Guano. Check the numbers on guano! Some is high in nitrogen, some very low. Keep in mind fresh manure needs 3-4 weeks after being tilled in to break down. Also, high nitrogen fertilizers can burn sensitive plants and build up high levels of nitrates in greens. Minerals are critical soil elements for all manner of plant life functions. Texas soils are generally high in calcium, so that commonly added mineral is unnecessary here. Things like Magnesium, Boron, and others can be low, so adding a full spectrum mineral blend from sea minerals or kelp is an excellent idea. Soil microbes are responsible for nutrient transport between the roots and soil hummus. Boost these with compost teas, and bacterial/fungal inoculants. The best control, is to make sure you have fertile soil, and appropriate plants for your climate and time of year. Disease and pests generally only show up when something is out of sync, weak, dying, or exotic. Many choices, but keep in mind most organic control require multiple applications rather than once and done like chemicals. Diatomaceous Earth is great for all hard shelled insects, but must be reapplied after wetting, BT is great for caterpillars and predatory moths/butterflies, Neem or Azatrol is a good general purpose deterent, but will harm pollinators too, so don’t apply when pollen is being collected. Use nature to your advantage. Encourage bird and insect habitat to attract predators. 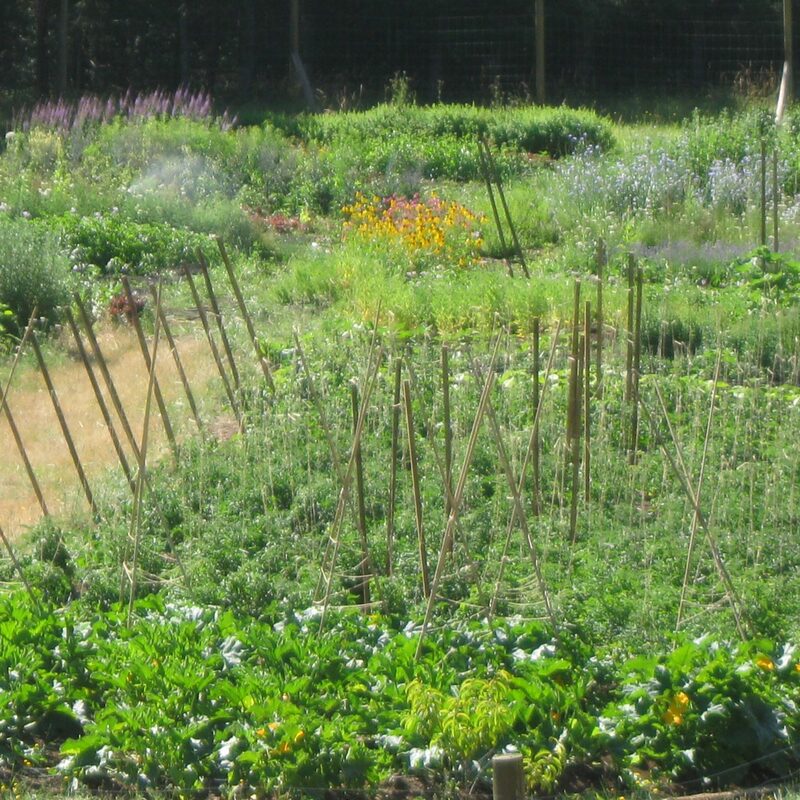 Companion planting diversifies your crop and helps with symbiotic plant relationships. One for the bugs, one for the crow, one for the rot, and one to grow. In other words, factor in some degree of crop loss always. At the end of the day, time and money spent on poisons don’t outweigh the losses in a properly managed organic set-up.